Hoof and Hair Guard is powerful hoof and hair supplement that contains 100 mg of Biotin per dose as well as mega-doses of Methionine, Zine, Lysine, Glysine, Cystine and Phenylalanine. Formulated to help horses with severe hoof ailments, Equine Veterinarians often prescribe Hoof and Hair Guard for their toughest cases. 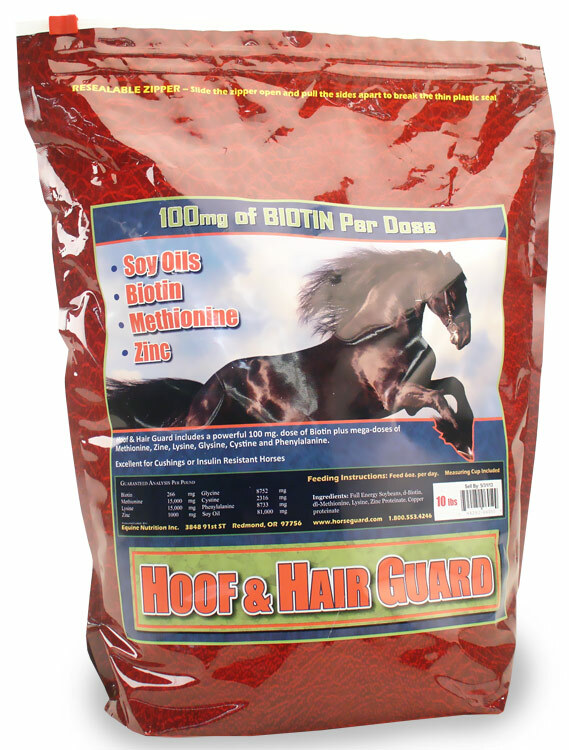 Whether assisting horses in shedding out their winter coats, growing long and fullmanes and tails Hoof and Hair Guard helps horses to look their absolute best. All food is shipped ground delivery. Please allow 7 to 12 days for your delivery to arrive. Please note, we do not ship pet food internationally. For more shipping info click here.